Hazardous materials storage, if not properly handled, can sometimes result in the release of harmful gases or liquids. Often times, these leaks lead to evacuations. West Houston was subject to a chemical leak at ConocoPhillips, resulting in the evacuation of an entire building and a warning to Houston drivers to avoid the area. Four employees were transported to the local hospital, only as a precaution. The leaked chemical was a chlorine solution, which reacted with another chemical in the hazardous materials storage area. Chlorine is a poisonous, yellow-green gas that can rapidly spread if released, and is corrosive to the touch, making it highly dangerous when released. It is very reactive and the liquid produces harmful vapors, so evacuations were necessary for the safety of the personnel. Hazardous materials storage laws call for chlorine to be separated from any potentially reactive chemicals. Recent reports state that the chemical leak has been cleared and that drivers are allowed through the area. 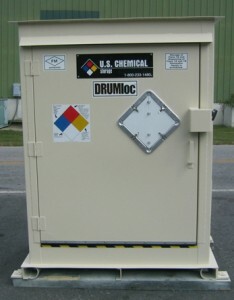 Hazardous materials storage laws are in place to protect personnel. It appears the company and emergency services acted swiftly to prevent harm from coming to the personnel. Inhaling chlorine gas or coming into contact with the chemical can result in dangerous reactions. With chlorine solutions, the best way to avoid dangerous chemical reactions is to comply with all hazardous materials storage laws pertaining to your chlorine. Our CHEMLoc storage unit is designed to protect personnel from dangerous reactions, built of continuously welded 12-gauge steel, with a containment sump built to your specifications to contain any leaks or spills that may occur. Segregating reactive chemicals such as chlorine will prevent dangerous reactions from occurring. We take pride in the fact that our chemical storage units are the most reliable in the industry, as we’ve helped companies protect their employees and their reputations for 30 years running.